Uglyworld #1883 - Easters Roadie - (Project Cinko Time - Image 90-365), a photo by www.bazpics.com on Flickr. 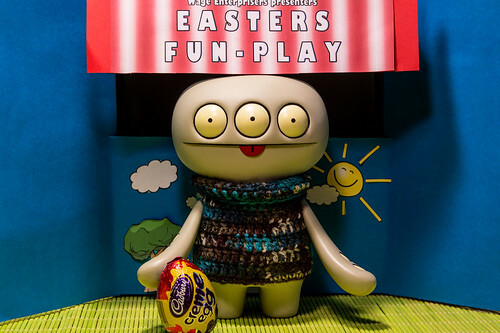 Hey theres everyone, as you may recalls my gooders buddy Wage has an Easters traditioner of putting on a specials fun-play for all the littler uglies and this year I was askereds if I would likes to be an easters roadie! I had no ideas what a roadie was at firsts, but Wage tellereds me it a really easiers job, I just hads to helps setter ups the stage and makes sure everything was readies to go for the bigs performancer tomorrow. Bestesters of all, every roadie gets payereds in cadburys creme eggies, it's like my all times dreamering job!!! As you can sees, I has now settereds up the stager and it's time for me to head on back to the cookie cave to enjoyers my creme egg, then gets to my beddies early as I has a biggers day aheads of me tomorrows! I hopes you will all comes along and watchers the performancer, it always rockers!